A couple of years ago, I threw a bunch of quick doodles into my notebook for new mug designs. In the two drawings above, the cup would have a standard shape but the handles would express interesting mathematical ideas. On the left, the handle is bent into a trefoil knot, as a kind of response to the joke that a topologist doesn’t know the difference between their coffee mug and their doughnut. On the right, the handle would never quite close up, instead branching and reconnecting into a truly wild form known as Alexander’s Horned Sphere. 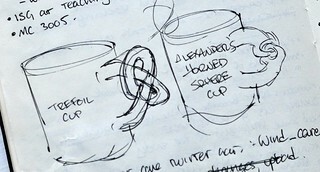 Well, a mug with a trefoil handle isn’t that hard to construct as a 3D model, even for someone with my meagre skills. I quickly threw together a prototype and requested a 3D print in ceramic from Shapeways. They responded that this model could never be printed in ceramic: the raw part is too delicate, and the heavy handle would collapse before the ceramic was fired. I put the design on the back burner, hoping some day to find another way to realize it. Last year, Shapeways announced that they were piloting a new porcelain process as a replacement to their old ceramic one. Furthermore, they claimed that the new process would be much closer in quality to their existing plastic process, which sounded like great news. I decided to sign up and see if the new technology could handle the trefoil mug. It was with great excitement, then, that I opened today’s delivery to see the results. 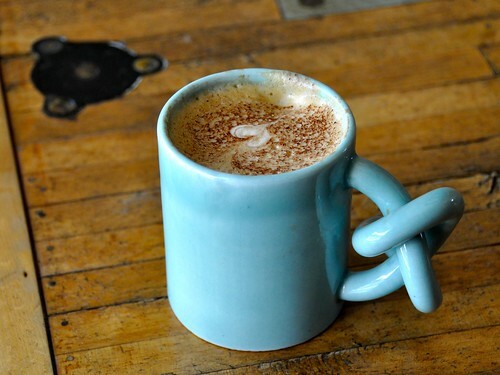 The trefoil mug, fresh from Shapeways, out for its first test-drink at DVLB. The quality is superb. The build is nice and clean, and the Celadon Green glaze looks gorgeous. The handle held its shape perfectly, and looks downright sensuous as a free-floating curve in space. A close-up of the trefoil handle. Returning to the topologist joke, it should be said that a topologist also wouldn’t know the difference between their doughnut and their trefoil mug: the two shapes are topologically equivalent. However, they’re most definitely not equivalent as knots, and so we can be confident that a knot theorist would know the difference. 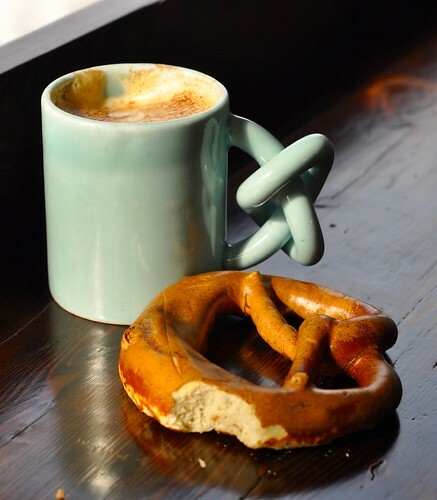 The consequence, of course, is that you should pair your trefoil mug not with a doughnut, but with a different snack food. 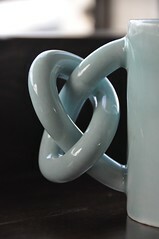 It stands to reason that one should eat knotted food with any drink served in the trefoil mug. I’m excited about the future of this porcelain process. I’ve already ordered a few more items from Shapeways. I have another copy of the Little Dipper on its way (I always promised the kids I’d make one for each of them). I’ve also ordered a Moon Shot Espresso Cup; this is probably still a long shot, and it’ll be interesting to see if the details are even close to visible on the final cup. And what about the Alexander Horned Mug hinted at above? I modeled it last week and ordered it today. I think it’s probably ambitious as a test of porcelain printing, but I can’t wait to see if it prints successfully. If it does, I’ll post photos here! There are a few more photos of the mug in a flickr album, and here’s the mug’s page on Shapeways, where eventually I assume you’ll be able to order your own copy.